In his new book "Death by Identity Theft", Ken Buckler explores the many types of identity theft, its impact on victims, and how to reduce the risk for businesses and consumers. Hagerstown, United States, June 03,2016 -- Identity Theft is quite honestly out of control. As a cyber security professional working as a Federal contractor for almost ten years, Ken has worked diligently to help protect others from this terrifying crime. In fact, he thought he had taken every precaution to protect myself and my family. However, something he did not count on was that others would not take the same precautions. After receiving two data breach notifications from major retailers and a data breach notification from the Federal Government, he realized his identity was not as protected as he thought it was. So he started researching, and what he found was terrifying. He knew identity theft was a serious problem in the United States, but he didn't realize just how serious. What he has learned in the past ten years, including his past year of intense research into identity theft protection, will now be available in book form. Readers won't have to spend hours each day researching the best methods of protecting themselves, as Ken has already done that work for you. The truth is, no-one can prevent identity theft. However, we can lower the risk, and reduce the consequences. 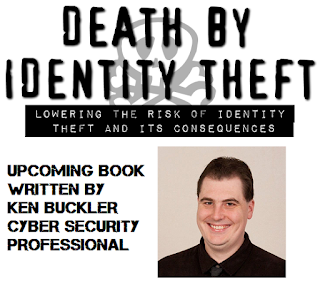 Ken's new book, "Death by Identity Theft", aims to do just that. Ken has setup an early access preview of his new book for only 99 cents (a $5.99 value). Those who purchase before July 1 using the coupon code "earlybird" will not only receive the full book when it's complete, but access to what Ken has written right now.